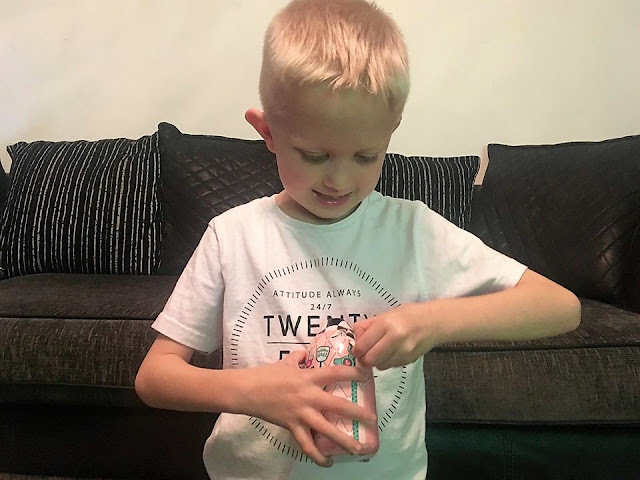 As you may have seen from our previous blog posts, my youngest child absolutely loves the unboxing of items and the revealing of surprises, whether this be watching someone else do it on YouTube, or discovering the toys for himself, it certainly provides him with plenty of entertainment. Therefore when the opportunity recently arose to check out the new L.O.L Surprise!™ Fuzzy Pets, he was more than happy to assist. These fabulous little toys allow you to unbox seven surprises, with this all new product from the series. Each item provides a little hint as to the pet that is hiding inside and which fuzzy animal you are likely to receive. Not only are there plenty of surprises inside, but these gorgeous little pets can also be customised, by applying your makeover skills to change its appearance and remove the outer layer of fuzz. It is a fabulous addition to the L.O.L range and is sure to bring plenty of excitement to any L.O.L Surprise!™ fans. My youngest son Riley is aware of the L.O.L Surprise!™ range, but has not played with any of the products previously. However, as an animal lover with a great sense of creativity, he was really eager to take a closer look at the Fuzzy Pets series and find out some more about the toys. As soon as they arrived in the post, he was very keen to begin unwrapping the packaging and discover exactly what was inside. 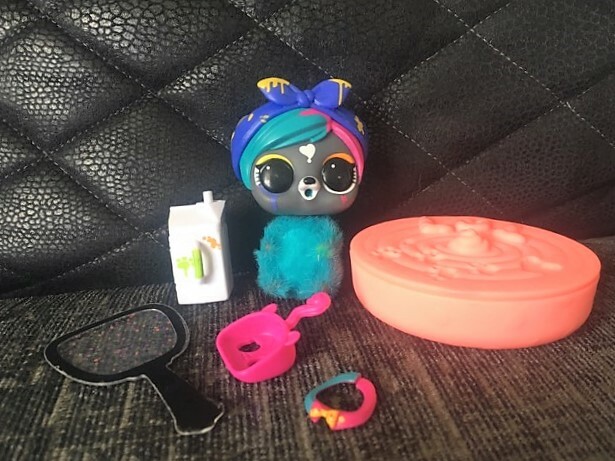 The product is aimed at children aged 3+ and each set comes complete with a fuzzy pet, a magic mirror, a feeding bottle, a secret message, a pooper scooper, an accessory, and an outfit. 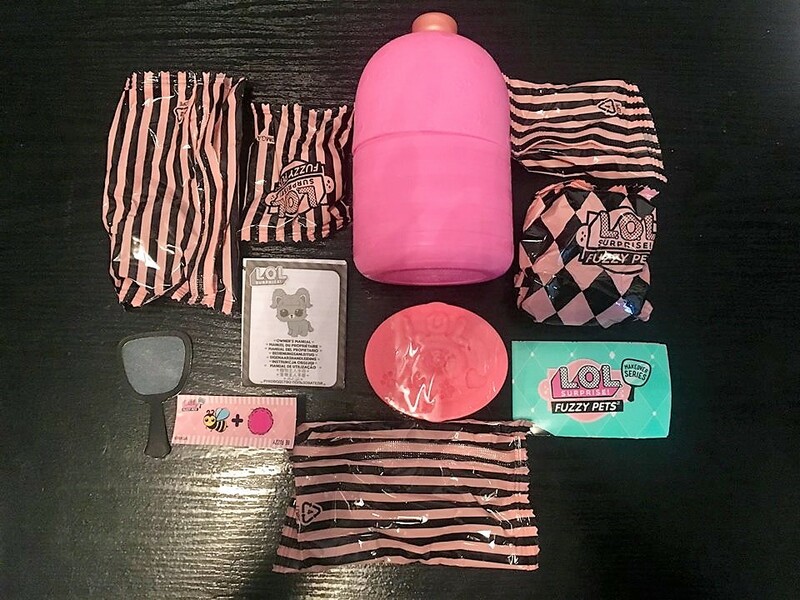 All of these items come presented in a shampoo shaped bottle, which is also multi-purpose, as this can later be used as the bath for your new L.O.L pet, or as a fashion accessory. Riley began to open his first fuzzy pet packaging, to reveal a shampoo shaped container. Inside this were numerous blind bags, which Riley excitedly ripped apart. The first items he came across were a secret message (which his elder brother helped him to decipher) and a glittery mirror. For an adult the secret messages are very simple, but for the age range that they are aimed at, it really encourages children to get thinking and my son was really pleased when he managed to figure it out. If you do have any trouble though, then the answer is written upside down underneath. Riley continued to open the packets and the next items he came across were a drinks bottle and a pooper scooper! He found the idea of a toy pooper scooper quite funny and as we have not played with these toys before, we were unaware at the time that we would get to use this later on. Further packets revealed what we initially thought was a bracelet (but soon realised was a carry handle), a fashion accessory and of course a fuzzy pet. At the bottom of the shampoo shaped bottle there was also an oval shaped container and Riley was very keen to see what was inside. 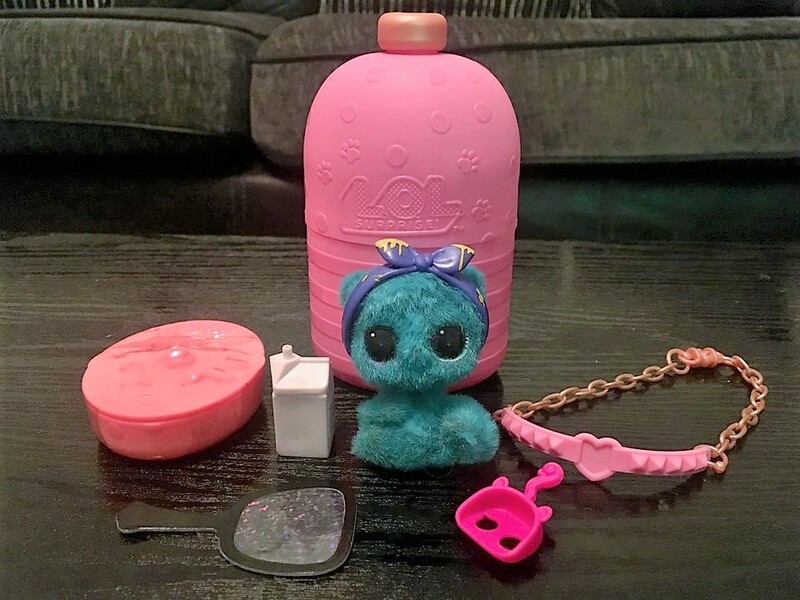 My first thought was that it may contain slime, which seems to be a common theme amongst toys at the moment, however we were both pleased to find that it was actually kinetic sand, which has been a favourite of all of my children over the years. We put this to one side initially, whilst we set about removing the fuzz from the pet. The instructions explain that you can also customise this by drawing your own patterns on to the fuzz with a wet cotton bud, however Riley was more excited to try and reveal the pet beneath the fuzz, so we went along with his preference and set up the shampoo bottle bath. It is important to remember to add the handle to the bottle at this point, as this closes two of the holes which are at the side of the bottle and prevents any water from leaking out. The handle also makes it easy to transport it to the sink and bin, once the fuzz has all been removed. The removal of the fuzz is a really simple and fun activity and you just need to fill the shampoo bottle bath with water, then place your pet inside and rub to remove the fuzz. Riley really enjoyed this part of the process and enjoyed watching the colour of the water change too. The tub is quite small when the pet is placed inside, so if you did find this too fiddly then you could always use a large bowl as an alternative. The bottle has a clever draining system, which I thought was a great idea, as this means that you can remove the lid at the bottom of the bottle to release the water into the sink, but the fuzz remains captured in the sieve type contraption. You can then simply empty this into the bin, making it really easy to clean after use. Something which is always a benefit to parents. On reading the instructions, we discovered that there was also a further treat hidden amongst the kinetic sand. We did not know this originally, so it was an added bonus and Riley was delighted to have the opportunity to use the pooper scooper to dig out his treasure. Once the hidden accessory had been discovered, it meant that Riley could also play with the kinetic sand, which gave another element of play to the toy. Riley decided to remove all of the fuzz on one of his pets, but on his second one he decided to try something a little different and chose to only remove the fuzz from the head, leaving the blue fuzzy body in tact. This means that he can change it in the future if he wants to, but he was determined to have a blue pet, so has decided to keep it that way for now. The pets can also squirt water from their mouths or cry, once they have been fed some water from their bottles. Riley really enjoyed squirting water at us and it provided plenty of laughter throughout the afternoon. 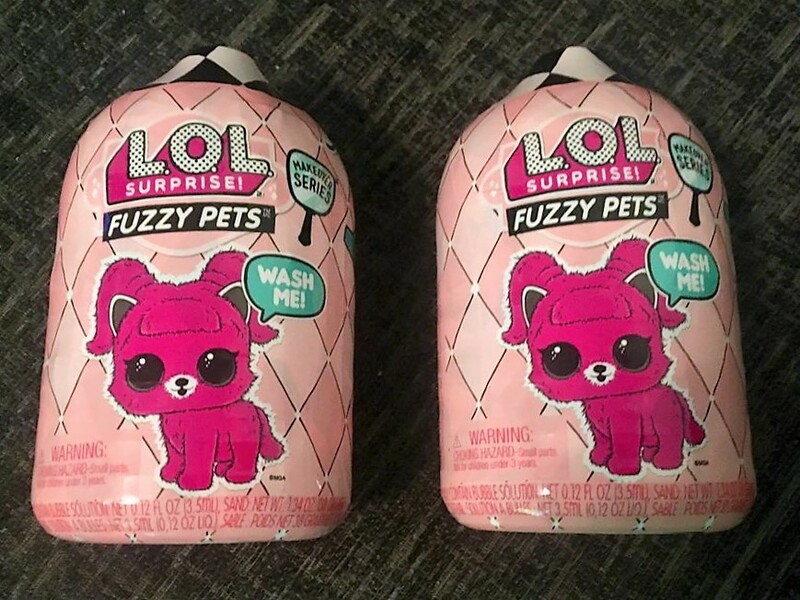 Overall, we had plenty of fun with the L.O.L Surprise!™ Fuzzy Pets and the whole family were involved when it came to removing the fuzz. 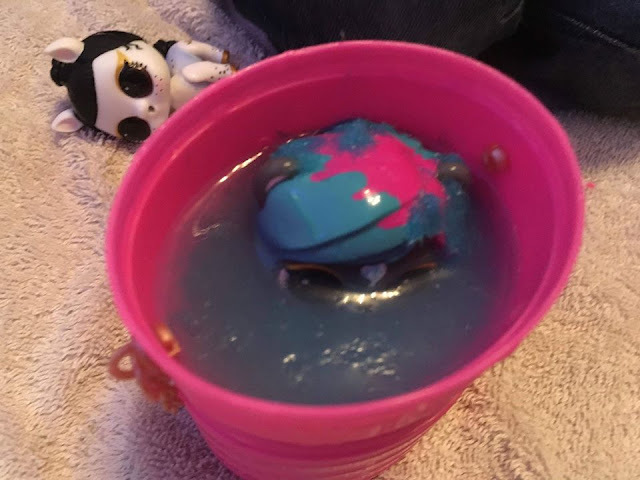 We had such a good laugh and a giggle whilst Riley revealed the pet and I found that the product was actually far better than I had initially expected it to be. With an RRP of £13.99, I think that these are great value for money and they certainly kept Riley entertained for quite some time. I would be more than happy to purchase some more of these for Riley in the future should he wish to expand his collection. Ultimately I would recommend this product to others for some fabulous L.O.L Surprise!™ fun. *Disclaimer: We were provided with two complimentary L.O.L Surpise! 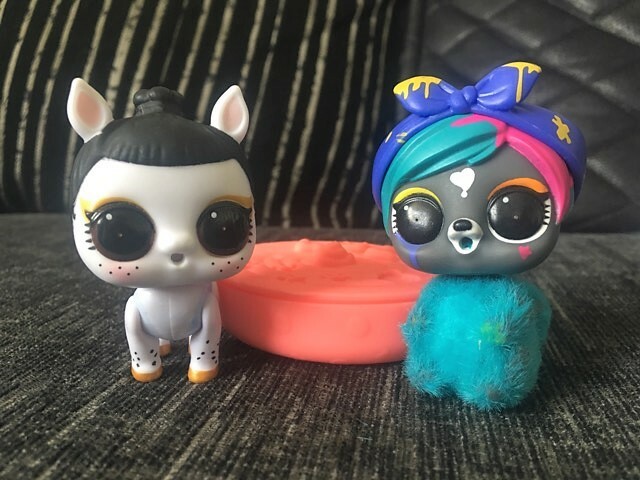 Fuzzy Pets, for the purpose of writing an honest review of the product. All thoughts and opinions are our own. This post contains an Amazon affiliate link, which means that I may receive a small commission should you choose to purchase from this retailer.